This decorative painting combines delicate beauty with a wildly rustic, country-western feel. These elements combine to make a great date night of drinking and socializing, while creating something trendy and beautiful together! Can be created on 1 or 2 canvases!! We will be painting on a 12” x 16” canvas but you can UPGRADE to a WOOD PALLET for $10 more. To upgrade, just pay $10 at the event OR call us @ 480.750.WINE (9463) to purchase over the phone. If you plan to upgrade at the event, make sure to note in your seating preferences so we plan to bring enough supplies OR email/call us to let us know. Happy Hour prices on select food and beverage!! There may be a special option for a bottle of wine and an app for $20 so bring someone to share with. We're on the move! 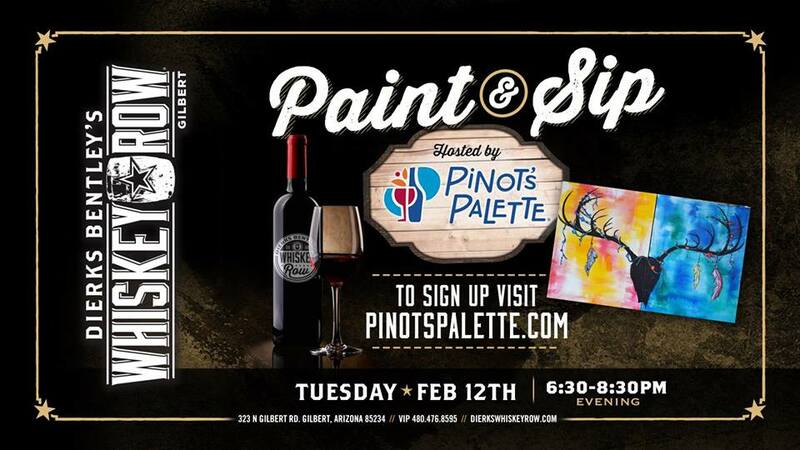 This paint party is happening at Dierks Whiskey Row Gilbert! !